To Cite: Nejat F, Dadkhah S, Fadakar K, Azar Homayoun A. Interchoroid Plexus Adhesion, a Rare Anatomical Anomaly Found with Neuroendoscope, Iran J Pediatr. 2013 ; 23(6):721-722. Myelomeningocele (MMC) is a malformation commonly associated with diverse cerebral abnormalities including Chiari II, hydrocephalus, corpus callosum agenesis, and absence of septum pellucidum. Gross choroid plexus anomalies like cyst and bifida have been reported before[2-4] but to our best knowledge, interchoroid plexus adhesion has never been reported so far. Our patient is an 8 month old girl, known case of MMC who underwent endoscopic third ventriculostomy (ETV) and choroid plexus cauterization (CPC) to address hydrocephalus. Her brain magnetic resonance imaging (MRI) was confirmative of aqueductal stenosis, corpus callosum agenesis and absence of septum pellucidum. During ETV/CPC, aberrant choroid plexus was found above the fornix attached to choroid plexus of both lateral ventricles at level of trigon that was cauterized (Fig. 1). Fig. 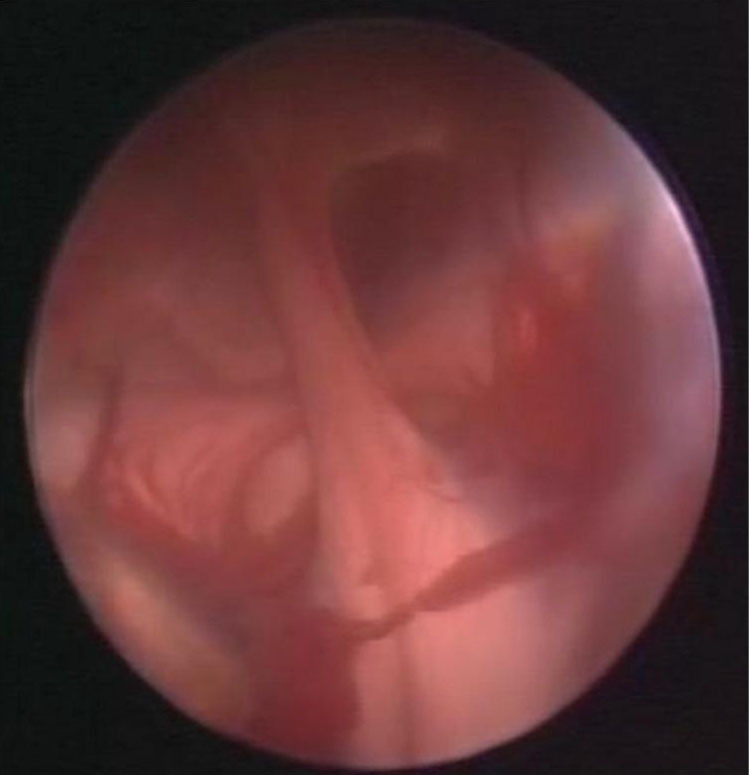 1: Photo taken during endoscopy confirms both lateral ventricle choroid plexuses and bundle of choroid plexus attached to them. plexus. The definitive form of choroidal fissure and plexus depends on growth patterns of neighboring anatomical structures[2-4]. Therefore absence of septum pellucidum can be responsible for this malformation of choroid plexus due to lack of any tissue between the primitive choroid plexuses of lateral ventricles. Considering this hypothesis, this malformation should be observed more frequently in patients with MMC and associated absence of septum pellucidum. Rarity of this anomaly might be partially explained bylimitation of current brain imaging to reveal this anomaly.